Let’s talk “Behind The Scenes” for a moment, alright? When writing one of these Dev Updates, it helps to plan ahead a bit. It involves knowing what’s happening at the moment, what’s going to be happening, and how it all ties together. That way (for example), if one week has a lot of small accomplishments and the next week has a single big one, a mini-narrative is constructed that creates a nice sense of progression week to week. This isn’t necessary, but it helps the audience appreciate “slow weeks.” An example of this can be seen in last week’s Dev Update. The entire update was devoted to explaining a large project that needed to be completed before Gears of Eden could move forward and providing justification for why it might take a few weeks before there’s any exciting progress to tell you all about. Then, the day after the Dev Update had been posted, we finished that large project. We SQUASHED the Spider-Rover and all his friends so fast that I can hardly believe it! I cannot express just how impressed I am with our fantastic team. With this out of the way though, how about I tell you about our progress since Thursday? We cleared a lot of minor bugs up off the bat, but the biggest accomplishment has to be the addition of the Free Cinematic Camera. This allows for players to pull themselves out of the normal gameplay experience to create artistic shots of the game that you wouldn’t normally be able to get while stuck in traditional camera modes that have you stuck behind the player character (or in first person perspective). This definitely needs further refinement, but even at this point of its development, this camera mode has been a lot of fun for us, and we look forward to sharing it with you. 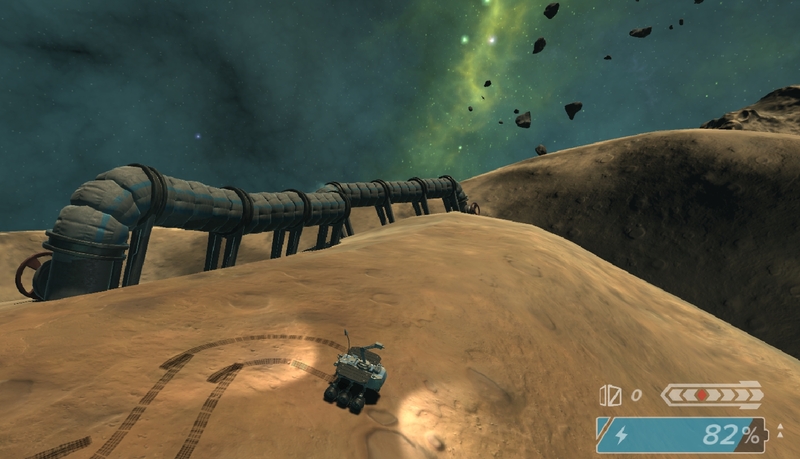 At the same time, we’re also working on setting up the infrastructure for the upcoming Alpha! This means building systems for authentication and access, as well as capturing gameplay data and statistics. There’s more information, like what to expect in our first alpha release and how you can participate, here. From our artistically talented team members, the crafting terminal’s model has been completed, and they are currently working on it’s texturing before bringing it into the game. 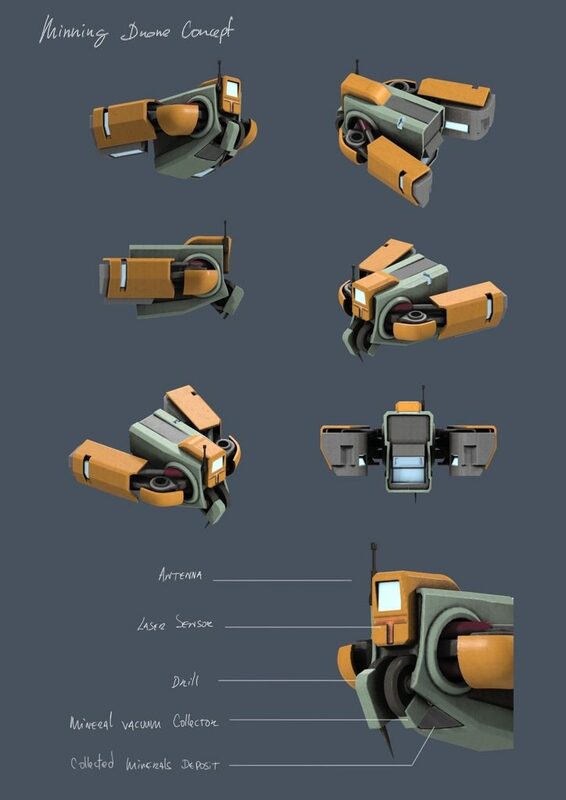 They’ve also concluded 3D Concept Work for the drones that the player will eventually be able to construct, and we should be seeing this hit the game soon as well! Finally, from our story team, we’ve put together a first draft on the opening dialogue of the game and get to have fun conversations about character voice and personality! There’s been so much this week, you guys. I really cannot express just how excited I am to see what we do next week, but I’ll be here next Wednesday to tell you all about it! Thanks for sticking with us during that tricky bug delay, it really means the world to all of us. If you want to see how this whirlwind of productivity continues, follow us on Twitter and Facebook. And hey! Our first Alpha is rapidly approaching, so if you haven’t already, consider donating to the team for a an Alpha Key! You can also enter a drawing to win one for free if you sign up for our newsletter! That’s it for this week though, I hope you have a great rest of your day!